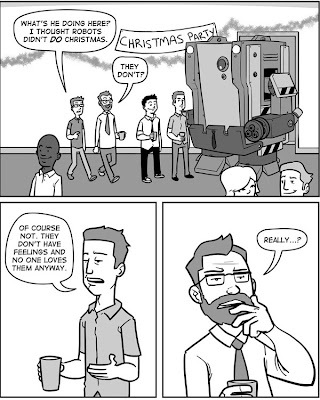 Warbot in Accounting writer Brian Clevinger has characterized his creation as something he’ll continue to make “until the internet cries out for us to stop.” Seeing how the strip is a mere fifteen pages long as of its last update in 2011, this isn’t strictly true. But Warbot is definitely an endurance test of a comic, the kind that stings its audience with hilarious cruelty and dares them to stop reading, knowing full well they won’t. As the story goes, in the near future the military created perfect killing machines called warbots. But unlike the trigger-happy establishment that governs us here in meatspace, this military-industrial complex bowed to public pressure and decommissioned the warbots. Their weapons removed and their programming appropriately altered, they were put to work in civilian life. 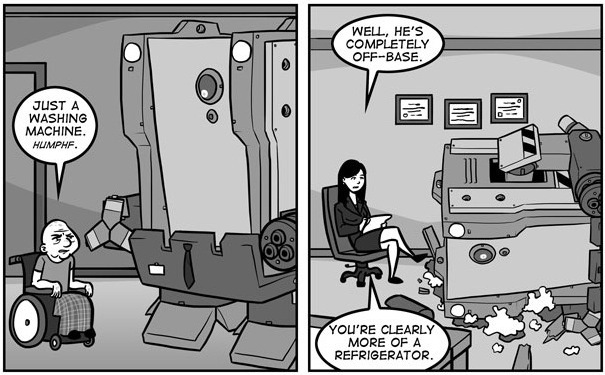 And that brings us to the titular warbot, X-17, who has found himself working in an accounting firm, a clip-on tie hanging where before a cruise missile might have. Warbot is a fish very, very far from water. In a world full of tasks that require communication and fine motor control, he has neither. He can’t talk, he can’t perform most simple tasks, and he can’t even do his job. 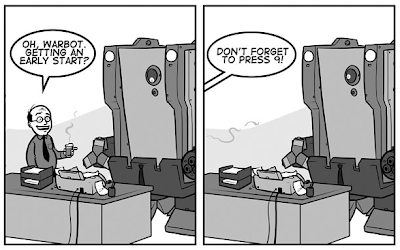 But at the heart of it, all Warbot really wants is to be happy. Immense credit goes to Clevinger and his artist, Zack Finfrock, for this; our lead character has no discernible way of communicating with the reader, and yet their storytelling ensures reader sympathy never lies with anyone else. 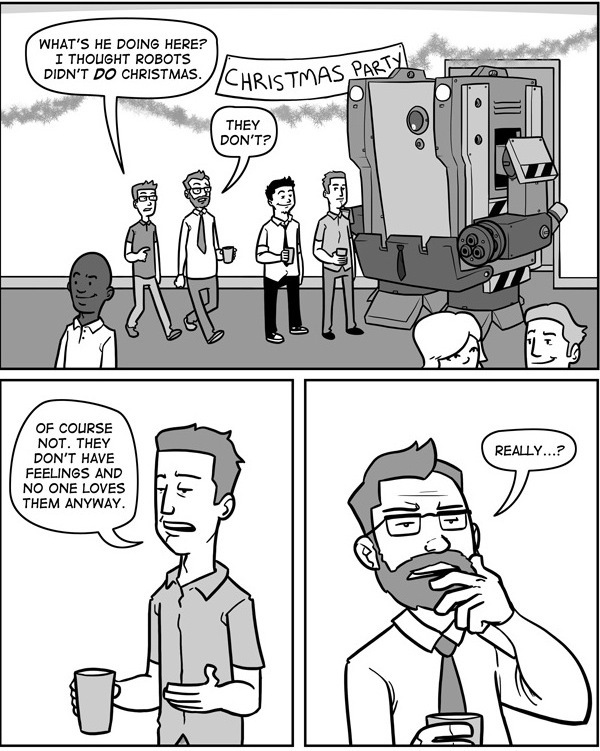 I feel I should mention this casual dismissal of Warbot’s feelings is one of the kinder strips of the bunch, by the way. The stoicism is a necessity of the character’s design; the entirety of Warbot’s range of expressions rests on where his eye is focused in a panel. The rest of it is all context, and Finfrock is sure to never make the frame too cluttered in his pursuit of that. It’s difficult to discuss the “plot,” such as it is, without spoiling things. The comic takes a gag-per-day approach to its storytelling, but there’s continuity and a story arc between pages. There’s no overarching mystery, though, nor any outrageous plot twists. The only mystery Clevinger and Finfrock are interested in is into how much deeper and darker a place can they push Warbot; the only twists are those of the universe’s knife deeper into his side, Lance of Longinus-style. C’mon. Click the link below. Like I said, it’s only fifteen pages long. You’ll laugh like a loon at your desk and all of your coworkers will immediately put in transfer requests. And that alone will give you a better life than Warbot could ever hope to have. 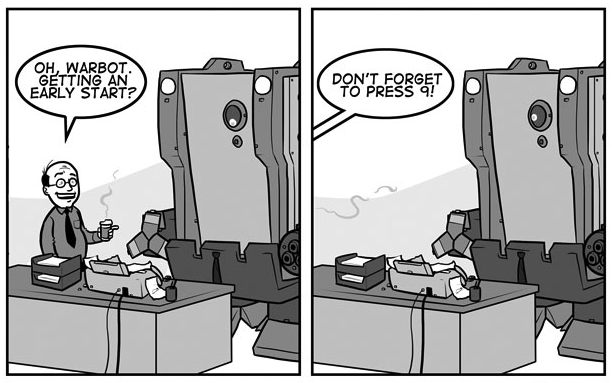 Warbot in Accounting is currently on an extended hiatus. It is/was written by Brian Clevinger and drawn by Zack Finfrock. It may be found here. Here is an example of a problem that a user of an accounting software sometimes brings to a quickbooks support phone number service provider. Wow!! I just read your article. It was inforamtive and well stiched. If you want any support on QuickBooks then feel free to seek help from our QuickBooks Support team at +1(800)-880-6389.